I’ll be the first to admit that I am one sentimental fool, especially during holidays, when everything is so steeped in nostalgia, tradition and folk art. My family has a very strong German background and one of the highlights of the holiday season is coming home to bake Springerle with my mom and grandma in Jamestown. Originated in the Schwabenland region of southwest Germany, which also originally included parts of present day France and Switzerland, Springerles are white anise-flavored cookies. 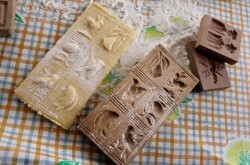 Essentially, they are edible relief prints. The hardwood forms used to make springerle are hand-carved with subject matter ranging from animal imagery to pop cultural icons like the Katzenjammer Kids; though carved rolling pins are often used as well. Some of my family’s molds belonged to my great grandmother are up to 150 years old. Though there are springerle forms that date as far back as the 1400’s. I asked my grandma to relate some of her earliest Springerle-induced memories. The making of these cookies has always been a family affair. When making springerle dough the eggs and sugar have to be beaten by hand for an hour to achieve the proper foamy consistency. After the proper consistency is achieved, flour is added slowly. Before the Feierabends, my grandmother’s family, had an electric mixer in the late 1930’s/early 1940’s, they, along with the maid, would gather around the table to pass the mixing bowl around, slowly adding flour. When the Christmas cookies were ready to bake, the family would take the dough to the local baker to ensure even baking. Rations were saved during wartime, making baked goods even more of a luxury. Unfortunately baked goods were next to nonexistent during the last year of the war because sugar was extremely scarce. The ingredients in Springerle are simple enough considering it’s a mixture of eggs, flour, and sugar. The most unusual ingredient is the traditional leavening agent known as hirschhorn salz or ammonium bicarbonate. Hirschhorn salz translates into “deer horn salt” and is made from finely ground reindeer antlers (how darkly festive is that?) and is the predecessor to modern baking powder. Grandma often encourages her Christmas baking crew to take a whiff of the hirschhorn salz. Unsuspecting bakers will get a nose full of ammonia stench, but fear not dear readers, it’s meant for baking and is non-toxic. Springerles are often stored a couple of weeks before Christmas. This way the cookies have a chance to cure and to soften. Sometimes food coloring is used to enhance the imagery on the cookie. Some people have also been known to preserve the hardened springerle with a varnish or shellac and paint them with either acrylic or tempera paints. It may seem odd to talk about cookies in an art column-but then again art isn’t confined to galleries. I’m a huge fan of folk art and an even bigger fan of getting three generations of Hornung women in one room to maintain a family tradition. If I’ve piqued your curiosity, tantalized your taste buds or triggered your memory, Nichole’s Fine Pastry is known to make Grandma-approved springerles around the holidays, minus the hirschhorn salz.